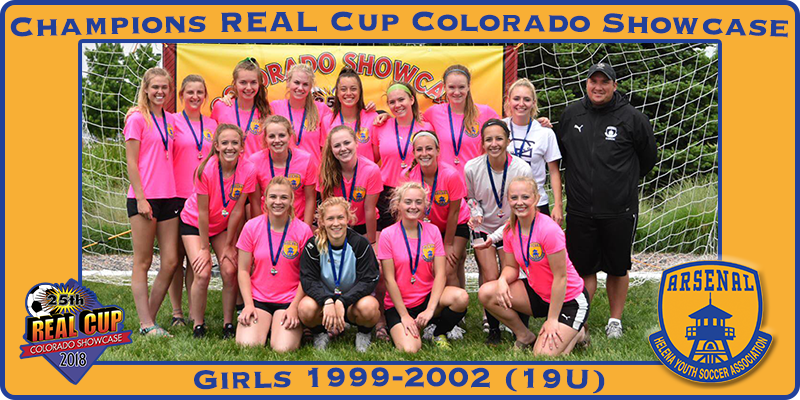 In a historic first for the HYSA Arsenal soccer club, the 19U Girls team coached by Colin Baker, came home as Tournament Champions in the prestigious REAL Cup Colorado Showcase soccer tournament. The team traveled to Denver over the Memorial Day weekend and swept the gold bracket. In the first game of pool play, Arsenal took on the Colorado Hawks from Denver. The Hawks scored early, and then it was all Arsenal for the rest of the match, with Arsenal winning 4-1. Two goals were scored by Ashley Carlson (one assist from Janie Maes), one was scored by Katie Martin (assisted by Kinzi Adams), and one was scored by Ellie Stiffler (Carlson assist). In its second game, Arsenal played the Minnesota Force. Arsenal unleashed in this game, delivering a blistering 8-0 loss to the team from Minneapolis. Two goals were scored by Maes, one from Stiffler (Carlson assist), one from Cailyn Wall, three from Carlson (one assist from Claire Benedetti and one assist from Martin), and one from Grace Lawlor on a PK. The final game in pool play was against the New Mexico Sting from Albuquerque. Arsenal again came out on top 3-0, with two goals from Carlson (one assist from Martin and one from Wall) and one goal from Wall. Arsenal ended up at the top of its pool and earned the right to take on the #1 team from the other side of the pool, the BSC Fusion from Omaha, Nebraska. The two teams battled it out on Memorial Day with the score tied 0-0 at the half. As time in the match was winding down and under a relentless attack by the Arsenal offense, the Fusion fouled in the box and Cassie Brisko drilled home the PK. It turned out to be the deciding goal, with Arsenal winning the championship with a score of 1-0. Arsenal’s overall goal differential for the weekend was a remarkable 16-1; after being scored on early in its first game, Arsenal responded with 16 goals in a row and was never scored on again. Opponents could not get through the defensive holding power of Hannah Bowers, Ty Cummings, Isabelle Melton, Tristin Soule, and Ellie Stock. Keeper Ashlin Slanger delivered again and again on crucial saves, and Francie Tupper and Regan Maronick helped create offensive opportunities crucial to Arsenal’s success.